« New Cycling Stomping Ground? Our boy, AKA ‘The Pok’, has started to say some really funny things with the reasoning of a 3 year old behind his musings. Some of it is hilarious, or just bizarre. Christmas brought with it far too many chocolates into our house, at least 2kg worth. Most of it was gifted to our 3 year old son, who now understands the concept of receiving gifts. Following four days straight of helping himself to a breakfast of chocolate, we had to put a stop to it. I put the remaining chocolates on the top shelf at the back of the fridge. 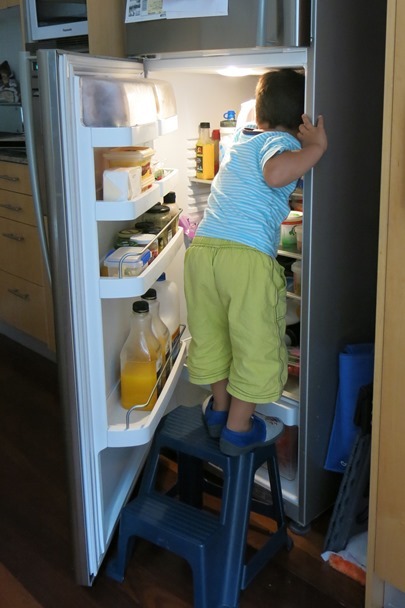 So it was to my surprise that when the two of us had a boys night without my wife watching Cars and Madagascar, my son was not begging to go raid the fridge. As we were lounging on the couch watching the second film, he bolted down the hallway for what I thought was a visit to the toilet. Less than a minute later I heard ‘beep, beep, beep’, the warning signal from our fridge that the door has been left open. I got up from the couch to walk down the hallway when I saw the cause of the noise. There was ‘The Pok’ standing on a stool with one leg on tiptoes reaching as deep as he could for the chocolates with the fridge door open. Has my Christmas parcel arrived yet? Sometimes you wonder where they are picking up those reasonings. LOL – I believe in this case he had a strong motivator, his stomach. Nothing instant about this one, there have been too many opportunities for me to take this shot of him.